Investing in silver is the biggest area of growth in the precious metals market. It’s 85 times cheaper than gold so is accessible to everyone and tempts investors with speculation of huge potential gains. But what is better for investment? Should you buy silver coins or silver bars? Today, I’ll take a look at 4 key comparisons between the two to help decide which one suits investment better. One of the key components of investing is getting the best possible purchase price for your asset in the first place. Certainly 1oz silver coins are more expensive per gram than larger silver bars like 1kilo and 5 kilo silver bullion. If you’re simply focussed on obtaining as much silver for your money as possible, then no doubt, buying big will achieve this. The cost of producing large bars is a far smaller percentage of the overall cost due to its scale and simpler design than coins. However, coins are fighting back, many of the popular silver bullion coins are now also produced in 10oz and 1 kilo versions too, offering the chance to own silver coins at virtually the same price as silver bars. If you had the choice between buying one silver bar weighing 100 ounces or 100 one-ounce silver coins, then I’d generally recommend the coins for divisibility. Imagine a scenario where you’ve already bought your 100 ounces of silver and the market is moving up quickly. When you choose to lock in some profit and sell, the large silver bar gives you one chance only. 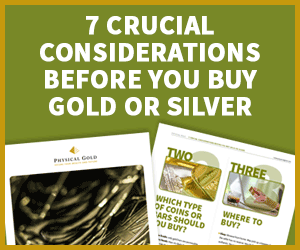 Once you’ve sold, your silver’s gone and you may miss further profits. With the silver coins, you’re able to drip feed the coins away, selling at various points to suit you. The other scenario is if the financial system really does reach a breaking point. In that case, it would be far more practical to use your 1oz silver coins to barter for bread, milk and petrol than a 100 ounce bar. Next up is the practicalities of storing your silver investment. For sure, silver bars are easier to store and take up less space. They’re larger and their rectangular size allows for simple silver stacking. An important aspect of investing is tax efficiency. VAT is generally applicable to silver when you buy, increasing your purchase price by 20% and impacting profits. Similarly, Capital Gains Tax may apply to any profits made once you sell your silver. But there are ways around both. Here at Physical Gold, we’re the only UK based dealer who can deliver silver coins and bars without charging VAT. The silver has to touch another point in Europe in the supply chain and have a face value. All our silver coins therefore qualify. While silver bars generally wouldn’t feature a face value, we do sell silver bars in a selection of sizes that do, and therefore are VAT free. So far, so equal between silver coins and bars. The way of avoiding incurring any Capital Gains Tax is to buy and sell UK legal tender silver coins. Common Royal Mint coins such as the silver Britannia, Lunar Series and Queens Beasts range of silver coins are all CGT exempt. The Royal Mint do not produce silver bars with a face value at present, so selling bars would be taxable. Now, that may not be an issue if your profits are under the tax threshold of around £12,000. But for many, looking to benefit from silver’s price potential, it’s perhaps not a risk worth taking. So which type of silver investment wins overall? I’d recommend starting your silver investment with silver coins. Sticking to British coins provides good value, divisibility, tax efficiency and the chance to store in monster boxes. But as you build your silver portfolio, there’s definitely a place for adding silver bars. This can bring the overall purchase cost per gram down by a few per cent and combine well in all areas with the silver coins. If you found this video helpful, don’t forget we have loads more videos covering all aspects of gold and silver investing. Check them out here. We’re the fastest growing dealer of silver coins and bars in the UK. Not only do we have a huge choice, but we also exclusively deliver the silver to your door VAT-Free! Combine this with live pricing and quantity discounts, it’s easy to see why we’re so popular for silver! If you need advice or guidance, don’t hesitate to call a member of our expert team on 020 7060 9992. Alternatively engage on our live chat on the website or leave us a message here. This entry was posted in Blog, Guides and tagged silver bars, Silver Coins, video.